Bill Shorten, the leader of the ALP opposition, strode the stages of the National Press Club and delivered a speech that The Australian described as ‘Corybn-like’ and a ‘populist pitch to low-income earners, unionists and left-wing voters’ (Brown, Chambers, and Additional reporting: Sarah Jane-Tasker 2018). But before we break out the red flags and rally around Comrade Bill we should pause and stop: for the content of Shorten’s speech was actually terrible, a continuation of the ALP tradition of class appeasement and compromise and wrapped in mystifications about the nature of capitalism, wages and class. It was the exact opposite of the approach that we need. That the causes of our misery are from errors or problems that can be solved within the boundaries of the capitalist mode of production. Rather than being swept up in the appearance of some kind of radicalism or broadly pro-worker rhetoric it is necessary to be razor-sharp and expose all that is wrong with the approach of the ALP. As Humphrey McQueen has written the ALP is ‘fog-bound within capitalism’ (1977, 345). The point of critiquing the ideas of the ALP is not to change their minds but rather to help dispel the fog of illusions that threaten to cloud ours. 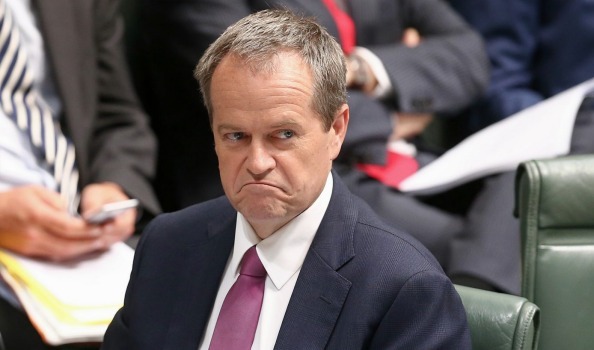 Shorten’s speech identifies one of the core contradictions in contemporary Australian society: that despite the economy growing and profits being up wages are stagnant and the standard of living is falling. ‘After allowing for inflation, taxes and interest costs, average household incomes dropped 1.6 per cent in the year to September, capping a sustained fall in ­living standards that has not been seen since the 1990-91 recession’(Uren 2018). Indeed there was 6.1% rise in personal bankruptcies in 2017 (Baily 2018). The collapse of enterprise bargaining and the increased reliance on awards to set wages. Attempting to address the gender pay gap. This is the old ALP playbook. Frank Hardy wrote in Power Without Glory the basis of Laborist policy at its origin was ‘an eight-hour day, industrial arbitration, exclusions of Asiatics, early closing of hotels, etc.’ (1975, 137). The ALP attempts to mitigate the conditions of the workers by trying to arbitrate the relationship between capital and labour through the state in the name of a greater shared national interest. Rather than direct confrontation with capital Laborism aims to push up wages through increasing productivity and limiting the size of the labour market via restrictions on immigration. The ALP and unions have historically been able to win some improvements in conditions, but this approach means in practice that it places workers in a subordinate position to capital. Hence possibly the most successful ALP government ever, the Hawke-Keating government, restored profitability to capital and drove down wages (Humphrys and Cahill 2016). What the entire ALP tradition (which includes the majority of the history and organisations of the Australian union movement) misunderstands is the nature of the capitalist mode of production, of wages and of the relationship between capital and labour. The current economic orthodoxy is that wages are determined by how productive workers are in the workplace – though even its proponents are forced to admit this hasn’t actually been the case for decades and they can’t explain why (The Australian Government the Treasury 2017, 2). Shorten suggests that we can fix this by formally tying together productivity and wages through enterprise bargaining. This is nonsense. The capitalist mode of production is made up of countless different firms each driven by profit and both in competition with and also interlinked with each other. Marx writes ‘each individual capital forms only a tiny fraction of the total social capital…The movement of the social capital is made up of the totality of movements of these autonomous fractions, the turnovers of the individual capitals’(1992, 427). The driving dynamic of each firm and the capitalist mode of production on a whole is profit: to take money and transform it into more money endlessly and on a constantly increasing scale. This is what capital is. At its most basic level profit arises from the differences between costs and sale-prices. Each firm tries to buy low and sell high and rationalise its expenditure and the time of business processes as much as possible. Firms that produce commodities (whatever that commodity is) do something extra: they employ workers and then put them to work trying to get them in the processes of production to do work of a greater value than the wages they are paid. The working day is constant battle between the time it takes for workers to ‘earn’ their wages and the extra time that is a provided for free to the boss. This is surplus-value – and it is the origin of profit for the system on a whole. Firms constantly attempt to increase the size of surplus-value in relation to wages by multiple different means: such as holding down wages, pushing for an increase in the time of work, and increasing the productivity and intensity of labour. [ii] Since each firm is part of a broader network of firms and all of them are in competition with each other the surplus-value created at one place often sloshes around the system on a whole and may become the profits of another company. The exploited sandwich worker might create surplus-value that ends up on the balance sheet of the power company that sells the electricity to the greasy spoon that employs her. Even firms (and NGOs and government departments!) that don’t produce commodities and thus don’t create surplus-value still attempt to put as much pressure on their staff as possible, to minimise wages and push up the workload as it contributes to determining their share of profit. NGOs and government departments even if they don’t make a profit still aim to maximise work and output in relation to their budgets. Firms do this not simply because ‘they can’ as Shorten says but because they have to! Capital is driven by profit. Companies are in competition with each other. Firms that can’t sell around the average level of prices, run at the average level rate of costs and make an average level of profit go out of business. Capital flows from businesses of lower profit to those with higher profits crowding the markets they move into and emptying the ones they leave. As one company pushes for profits by revolutionising production – new machines, new techniques etc. – it sets the bench mark for all others to follow or perish. Each firm is caught in ‘the coercive laws of competition’(Marx 1990, 433). Capitalist firms must behave like capitalist firms or they are destroyed by other ones. It is in the inescapable DNA of the capitalist mode of production that each firm is driven to deepen and extend exploitation. As workers we sell our ability to work: our labour-power. This is a potential that lives in our bodies, ‘the aggregate of those mental and physical capacities existing in the physical form, the living personality, of a human being…’ (Marx 1990, 270). In capitalism labour-power is a commodity and like all commodities its price gravitates around the cost of reproducing it ‘in spite of the fluctuations in prices of commodities, the average price of every commodity, the ratio in which it is exchanged for other commodities is determined by its costs of production’(Marx 1978, 39). The costs of the production of labour-power is the cost of the reproduction of the worker that contains the potential to work. Wages cover the (partial) cost of reproducing ourselves as workers so we can go back to work tomorrow and raise another generation to replace us (many of the costs of doing this are also provided by the state or NGOs, performed by unpaid work in the home traditionally done by women and our wages are supplemented by credit). But the costs of our reproduction are not fixed, they aren’t the bare minimum that we need to live but rather reflect a certain social standard at a particular time. Remember that this quantity of value (wages) necessary for the reproduction of labour power is determined not by the needs of a ‘biological Guaranteed Minimum Wage (Salaire Minimum Interprofessional Garanti) alone, but by the needs of a historical minimum (Marx noted that English workers need beer while French proletarians need wine) – i.e. a historically variable minimum. I should also like to point out that this minimum is doubly historical in that it is not defined by the historical needs of the working class ‘recognized’ by the capitalist class, but by the historical needs imposed by the proletarian class struggles ( a double class struggle: against the lengthening of the working day and the against the reduction of wages)(Althusser 2008, 5). So what then determines this ‘historically variable minimum’, what is considered a reasonable standard of living? It is the interaction between the legislative framework, the negotiations, and thus the power-relation, between capital and labour (whether that be the through the picket line and strike or the individual contract with the boss),the demand for labour, both number of and skillsets, determined by the size and composition of investment, relative to the supply of labour and the supply, prices (including changes in the value of currencies wages are paid in) and variety of commodities and services. It is struggle, in the context of the dynamics of capital accumulation, which determine wages. Whilst Shorten argues for a win-win situation this ignores that the relationship between capital and labour is antagonistic. The division between wages and profits is a hostile one. This is struggle in the broadest sense. Not just the direct struggle of when a manager asks that you work unpaid overtime or when we vote to strike. Legislation reflects our relative power to impose our demands on society, capital’s power and the state’s attempts to manage away and repress conflict. The arbitration system which typified Industrial Relations in Australia for most of the 20th Century arose, partially, out of the defeat of the strikes of the 1890s (Sorrell 1977, 249). The investment of capital and the production of goods and services, the very normality of capitalism, is struggle. It is always a question of capital’s ability to impose work towards the ends of making a profit and our ability to resist this imposition, and where possible assert a set of different demands and desires which ultimately point to something outside of the boundaries of the capitalist mode of production. There is a further complication to this. In situations where we start winning, where we start pushing for wages and conditions at such a level that it chips into profits the capitalist mode of production starts to increasingly malfunction. This is the story of the 1960s and 1970s. ‘Falling profits and mounting social unrest made a mockery of Keynesian claims to reconcile social conflict and ensure the harmonious, crisis-free development of capitalism’(Holloway 1996, 32). The success of struggles across society, both inside the workplace and outside of it, heaved the capitalist order into crisis. Wage rises, welfare demands, new claims made by feminism, Black Liberation and Gay Rights, National Liberation struggles, the breakdown of discipline and order across society and the globe squeezed profits, forced up state spending, broke the post-War dollar standard and compelled capital to flee…and then counter-attack. This is the real trap of our condition. As those with only our labour-power to sell we rely on someone being willing to buy it. But as our struggles hurt capital we force capital to retreat and flee from our insubordination. It is crucial that we understand this, so we don’t miss our rendezvous with history. Arguments that wage-rises will solve the problems for capitalism by increasing aggregate effective demand miss the point that profit is the driver of investment. Anything that hurts profits destabilises capitalism. Any victory we win will cause capitalism to function increasingly poorly. Therefore, it is necessary for us to have a vision that sees a way out of the capitalist mode of production. As hard as it is to imagine right now rather than the snake oil of the ALP we could consider a different path: we collectively organise so we can push for our interests in the here and now as part of the struggle to overcome capitalism and create a society of dignity where we can all live lives worth living. This may involve reinvigorating old organisations and it may involve inventing new ones. To do this it helps if we dispel the fog of errors that emanate from the ALP. Australian Bureau of Statistics. 2017. 6321.0.55.001 - Industrial Disputes, Australia, Sep 2017. Australian Bureau of Statistics [cited 5th March 2018]. Brown, Greg, Geoff Chambers, and Additional reporting: Sarah Jane-Tasker. 2018. "Shorten in Corbyn-like class pitch." The Australian, 31st January, 4. Hardy, Frank. 1975. Power Without Glory. Frogmore, St.Albans, Herts: Panther. Holloway, John. 2010. Crack Capitalism. London: Pluto Press. Humphrys, Elizabeth, and Damien Cahill. 2016. "How Labour Made Neoliberalism." Critical Sociology. doi: 10.1177/0896920516655859. Jericho, Greg. 2017. Why workers are losing their share of Australia's national income. The Guardian [cited 6th March 2018]. Available from https://www.theguardian.com/business/grogonomics/2017/aug/15/imf-report-shows-lower-unionisation-leads-to-lower-wages. McQueen, Humphrey. 1977. "Glory Without Power." In Australian Capitalism:Towards a Socialist Critique, edited by John Playford and Douglas Kirsner. Ringwood, Victoria, Australia: Penguin Books. Sorrell, Geoff. 1977. "The Arbitration System." In Australian Capitalism:Towards a Socialist Critique, edited by John Playford and Douglas Kirsner, 248-64. Ringwood, Victoria, Australia: Penguin Books. The Australian Government the Treasury. 2017. "Analysis of wage growth November 2017." In: Commonwealth of Australia https://static.treasury.gov.au/uploads/sites/1/2017/11/p2017-t237966.pdf. Uren, David. 2018. "Bill shock: standard of living slump." The Australian, 5th January, 1. [i] As workers we exist within capitalism. We sell our capacity to work and purchase commodities to survive. However we also are excessive of this; we rebel against being reduced to our role. ‘To mis-fit is a central part of everyday experience’(Holloway 2010, 85). This is the basis in the here and now of our capacity to struggle and create a different kind of society. The ALP plays a role of redirecting our energies into the boundaries of capitalism. [ii] Technically firms don’t see the concept of surplus-value. They see profit: the difference between their costs and their sales. As such they treat workers like the rest of their inputs and try to get the most out of them for the least spent. Despite some specific national differences between the UK and Australia and their relationships to other capitalist powers there are a number of similarities relating to the decline of working wages and social conditions that reflect the global nature of the post 2008 financial crash and underlying economic crisis and this good basic analysis is as relevant to the UK as to the Australian Labour Party irrespective of the left-right balance of power in those parties.